Cochin Shipyard Call Letter: All the shortlisted candidates will be informed about Cochin Shipyard Call Letter release date by recruitment board. Kindly note that the admit cards will be available online only and any other mode will not be considered for the same. Exam schedule and centers will be mentioned in the hall ticket. 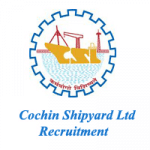 Cochin Shipyard Limited has announced 195 vacancies for various workmen vacancies. These include fabrication, outfit, and ship design assistant mainly. For more, you can check our recruitment article linked below. Selection method, paper pattern, and education qualification required are all different for all posts. Cochin Shipyard Admit Card release date will soon be declared by the regulatory authority. Post that all the selected applicants can visit the official website and get hold of their call letters. Please go through the article below and let us know any of your questions or queries in the comment section below. A direct link is provided below. Or the applicants can also get Cochin Shipyard download Call Letter option on its website once it is declared by the authority. A separate section on “how to download call letter online” is provided below. Please follow the same once you receive the notification from recruitment board. Shortlisted candidates will be notified about the call letter through registered contact details. A notification to download Cochin Shipyard Call Letter Online will be sent through SMS or e-mail. Please stay active on the same. We have already added a link below to download call letter. As of now, we have not received tentative dates or any other information about Cochin Shipyard Call Letter. Candidates are requested to bookmark the page to know all that is added here. You can also keep checking the official website as mentioned above. The selection method and exam pattern differ for all the posts as mentioned in the CSL official Pdf attached. Basically there would be a practical test and objective type as applicable. Based on the number of candidates exam centers will be set in various locations across Kerala. Further details on exam centers and dates will soon be updated right here. Selection method for all the posts/vacancies differ based on the regulatory requirements and fields included. They are briefly mentioned below in a tabular form. Please go through the official Pdf or recruitment article to know more about posts/vacancies. How to download Cochin Shipyard Call Letter Online? Shortlisted candidates will be informed to download Cochin Shipyard Admit Card through SMS or e-mail. After receiving official notification visit the CSL website @ cochinshipyard.com and click on “Career” option. A different page will open will latest advertisements announced. Check for CSL Workmen Call Letter option. Click and download hall ticket. Please note that the call letters will not be sent through post/courier or any other offline mode. 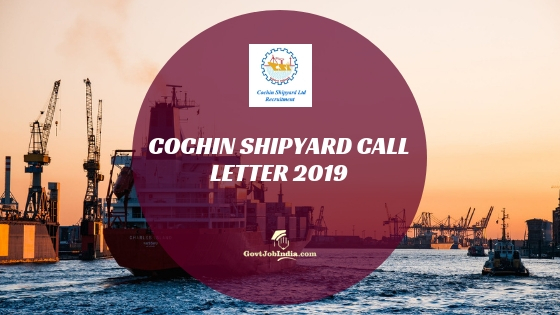 Hope the article above was helpful for all the applicants to know all about the Cochin Shipyard Call Letter 2019. Tentative dates or updates regarding the same are not yet declared. Please bookmark the page so that nothing important is missed. We will keep updating it as per the details received from recruitment board. Enter your comments or doubts in the comment section below. Our team will get back to you on relevant responses right here. For more opportunities to work with government of India visit our website govtjobindia.com. All the best!